My produce box this week arrived with a HUGE bag of organic arugula (also called rocket lettuce). If you haven’t tried fresh arugula, give it a try! It has a super fresh, peppery taste that adds a lot of zing to salad greens, sandwiches, pizza (in Italy we had prosciutto pizza topped with fresh arugula after it came out of the oven–AMAZING!) or on top of risotto (toss a handful on top of cooked risotto–yum! 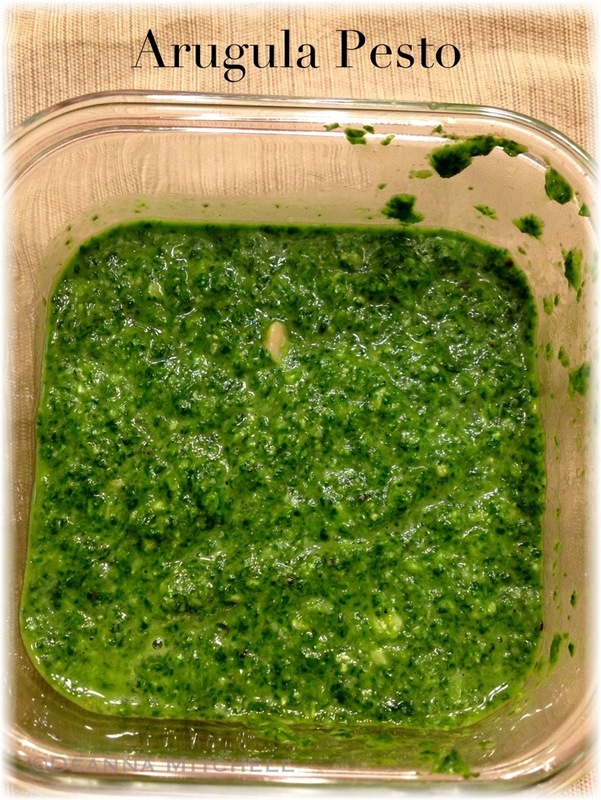 Since this was a softball game night, I used a couple handfuls to make this delicious arugula pesto, which I served in wrap sandwiches with smoked turkey, prosciutto and cheese. The garlicky, salty, spicy pesto added a similar punch to mustard, but with a cleaner, brighter flavor. The best part is, I have leftover pesto to use this week on lunch sandwiches or with our chicken! Arugula can vary from peppery to downright bitter, so when your shopping, taste the arugula before you buy (farmers are pretty good about that if you ask), or look for “baby arugula” which has a milder taste. Put all ingredients in a small food processor and purée until smooth. I adore arugula. But I’ve never made a pesto with it! Totally making this. And those wraps? Send me one for lunch tomorrow, please! 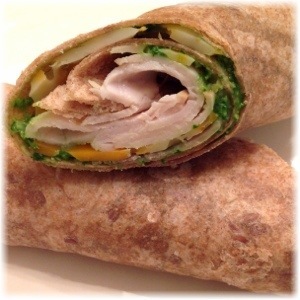 Yes, it’s a wrap kind of week–glad tomorrow is Friday!!!!! Hope you like the pesto!